It's not often one gets a do-over. Let's do it right this time and get B.C. 's carbon pollution under control. With flooding and wildfires on the rise, the negative effects of human-caused climate change are being felt here and now across British Columbia. In 2018, the B.C. government must stand up for a prosperous economy, safe communities and healthy families by taking strong and decisive action to combat the increasing carbon pollution that fuels these impacts. As February's throne speech and budget draw near, British Columbians are looking to Premier John Horgan and his government to seize B.C. 's second chance to get back on track to meeting our climate targets. After all, this government committed to plug the gaping holes in 2016's climate plan. Doing so will position our province to reap the benefits of the ongoing transition to a global economy based on clean growth. That means the electrification of industry, transportation, and buildings — powering them with clean rather than dirty energy — constitutes one of our most effective climate solutions. To accomplish this shift, B.C. will need to generate more clean electricity. In fact, according to modelling by Clean Energy Canada and Navius Research, we will need to more than double our electricity supply to curb carbon pollution, make good on our climate commitments, and build out the clean economy. The government has promised to legislate a new overall climate target for 2030 and establish separate targets and plans for the three most-polluting sectors. In 2015, B.C. 's Climate Leadership Team recommended carbon pollution cuts of 30 per cent from the transportation and industrial sectors, and 50 per cent from the built environment by 2030. That was three years ago; it's time for immediate action. By 2030, the Pembina Institute estimates carbon pollution from the building sector must be slashed by half in order to meet B.C. 's legislated climate target for 2050. B.C. is taking action on new homes and buildings via the Energy Step Code, but implementing it is still voluntary for municipalities. What's sorely needed is a strategy to reduce emissions from existing homes and buildings by an average of 60 per cent. This calls for the upgrading of 30,000 houses, 3 million square feet of commercial space, and 1 million square feet of apartments (or 17,000 units) every year until 2050. Starting in April, B.C. 's carbon tax will increase by $5 per tonne a year. By January 2019, all Canadian provinces and territories will have a price on carbon pollution. Around the world, B.C. 's carbon tax has been hailed as an economic and environmental success. B.C. can demonstrate how pricing carbon can be done in a way that encourages innovation, maintains companies' competitiveness, and ensures clean choices are affordable for all. Transportation is responsible for 39 per cent of B.C. 's carbon pollution. (Commercial transport accounts for 25 per cent; 14 per cent is attributed to personal transport.) Building out public transit, promoting zero emissions vehicles (by building more charging stations, for example), and ratcheting up standards for lower-carbon fuels are key ways to drive down transportation emissions. Developing more renewable energy sources is an essential part of the solution. But this alone doesn't equal climate action without a strong plan to cut down on carbon pollution. The latest figures put B.C. 's total emissions at 63.3 million tonnes (Mt) in 2015, up from the previous year. Most of this pollution comes from industry (41 per cent), transportation, and the built environment (17 per cent). B.C. 's legislated maximum is 13 Mt per year by 2050, and we're a far cry from that. 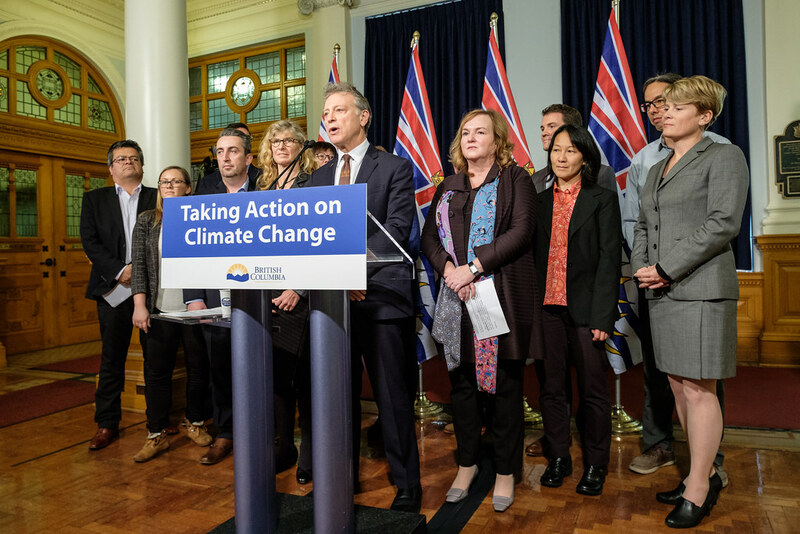 From Victoria to Terrace and Kelowna to Fort Nelson, British Columbians are increasingly concerned about the consequences of climate change — both now and in the future. Strong climate action is imperative to ensure our continued prosperity in the changing world. It's not often one gets a do-over. Let's do it right this time and get B.C. 's carbon pollution under control, and embrace the many opportunities of clean growth. Karen Tam Wu is acting B.C. director at the Pembina Institute, Canada's leading clean energy think-tank, and a member of B.C. 's Climate Solutions and Clean Growth Advisory Council.